and I wore the most beautiful dress for the occasion. I've been wanting to blog about this outfit for some time and I have finally got round to it! This is basically the most gorgeous dress I own, its encrusted with sequins and delicate beading. I've only worn it once, but I have a few important events this summer like my graduation, so i'll definitely be wearing this again! I felt amazing in this, everyone commented on the sheer beauty of the dress. A few little bits fell off but as i'm an embroidery student it doesn't matter, its easily fixed. 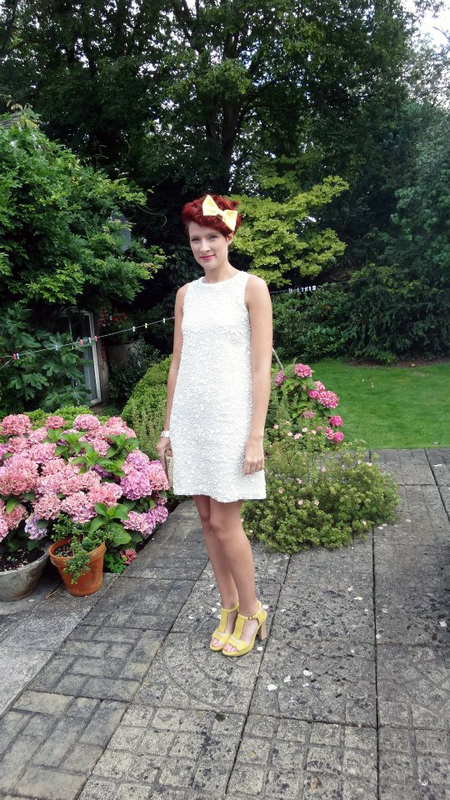 I styled my French Connection shift dress with some gorgeous yellow Camper shoes and a lovely bow from American Apparel. I didn't want to do the usual wedding head gear so I thought a huge bow would be more me. I quite like the yellow colour against my red hair. What do you think Cherubs? oo I love your dress! I'm sorry but I can't get over my love for your hair, it suits you so much!